Hey guys it’s Ginny here bringing you another room reveal at the Los Feliz house we’ve been working on. Last week we revealed the toddler girl’s bedroom and a few weeks ago the playroom. The guest bedroom is the last reveal of this phase of designing for these clients. I intro’d this space back in Feb which you can read all about it here if you missed it the first time round. They eventually want to redo their kitchen and living room which we’d love to get our hands on since the house is so beautiful and the clients are really great to work with. The guest bedroom is one of two guest rooms they have and is on the first floor level at the back of the house. It has it’s own en-suite bathroom and external access to the pool and patio area, making it the perfect space for visitors. They wanted to make this room feel cosy and inviting and above all have some cool charm to it. They didn’t have any furniture they wanted to keep so we were able to start fresh in here. The pretty oatmeal window shades were existing so we kept those and designed around them. They were pretty adventurous when it came to doing wall treatments in the house (we painted the playroom mint green and did a wallpaper in the girl’s bedroom). After proposing a few options to them and going back and forth on modern vs traditional, we came to a decision to go with a black toile. The black makes it feel slightly more edgy and less country Manor House. If you’re wanting to do a more modern toile there’s a really cool Brooklyn one from Flavor Paper we considered, but ultimately pushed the client to go more timeless and traditional. Although the house’s style feels quite traditional we were super cautious to not sway too far in that direction with the design. So we paired the wallpaper with modern feeling elements like the nightstands, sconces and artwork. We also added in touches of mid-century with the table lamps and vintage dresser. The nightstands feel a bit more on the industrial side with them being metal and wood, but that really helps to modernize the space. The back wall is also fairly large so the size of these feel right in here. All the artwork in here is the clients own and these prints are from Paper Jam Press. When using such a bold and busy wallpaper it’s better to go simple with the artwork so that it doesn’t end up getting lost. The graphic typography brings in a younger hip vibe and the negative white space around it gives your eyes a rest from the wallpaper, letting the art stand alone. The nightstand styling was kept fairly minimal and neutral. It’s a guest room after all so they didn’t want it to feel overly styled but wanted it to still have some interest. A lamp, a catchall tray (or bowl) and vase is all you really need (and you could go even less). Since the nightstands are pretty big we couldn’t not style out the bottom shelf. We used oversized books to break up the surface and added pottery to help make it feel more eclectic. You could also pop a basket in here instead for additional blankets or a place for guests to store items. There was space under the TV that was crying out for a piece of furniture, so we found a vintage steamer trunk that fit perfectly in here. To make it feel more ‘hotel-like’ we added extra blankets and a drinks tray to welcome guests. The little door behind the trunk is for access to the bathtub plumbing. I’ve never actually seen that before but actually makes sense. Kind of annoying that it has to be there though and break up our beautiful wallpaper. There isn’t a walk-in closet in here (there is in the hallway close by) but they didn’t want to add a lot of storage since the room isn’t that frequently used. We convinced them to go for this really cute mid-century dresser we found on Chairish. It really helps to add some soul into the space since a lot of the other large furniture pieces are new. With us adding artwork around the bed, we decided to install a round mirror above the dresser – helpful for guests, doesn’t detract away from the wallpaper and helps to bounce light. We styled this out a bit more than they have it for everyday and to mine & Melanie’s surprise (and sadness), they didn’t want to keep the brass hand lamp. It def goes a little 80’s glam but to us it added a little fun and whimsy in here. Adding fresh flowers or branches really liven up a space and we went with a slightly larger leaf so that it would stand out against the wallpaper – anything smaller would get lost. To add some colour in here we layered a mix of different blues, grays, white and oatmeal for the bedding. We also incorporated some pattern through the pillows with a simple graphic triangle on the white pillow cases and then a blue stripe on the flannel in front. With the headboard being a dark blue it created a divide between the wallpaper and the pillow so that each could stand alone and be seen. The blue throw blanket is from Pom Pom home (I have that and two of their shams) it’s a gorgeous soft organic linen in their indigo colourway. We styled this nightstand slightly differently here by centering the large books on the bottom and a large footed ceramic bowl on top. Instead of a tray on the top we used a stack of books to sit the catchall dish on – perfect for keeping jewelry safe and in one place. The two cute black vases on the nightstands are by Melanie’s BF Blake Beaudette. He hasn’t updated his shop in a while but check back in again soon, I’ve seen some of the new stuff he’s making and it’s amazing! So there you have it – a traditional yet eclectic guest bedroom. Do you think we should have gone with a modern toile or do you like the more traditional in this space? Would love to know what you think. We compiled some before // afters below and if you like this room keep scrolling for the sources along with the ‘Get the Look’. Love the room; but what’s up with the formatting of the pictures on the posts lately? They are smaller than they used to be, and not great for seeing all the great design details. I came back an hour later and see that the photos are back to their old, larger size! Sorry to be a serial commenter, but after I entered by reply above, the pictures are smaller again. Maybe I need to clear my cookies/cache. Again, sorry. I noticed it, too. At first I was like, what gives? But then I was like, these blog posts are loading way faster on my computer and in general are easier to read than usual. You can also click on each individual picture to enlarge and scroll. That’s interesting… the photos on my browser haven’t changed. They take up the majority of my screen. I’m using Chrome. Your blog is the second thing I open and read every day when I log on to my computer at work…so I’ll be back regardless. Keep doing what you guys are doing! I am so very into this room! Thank you for sharing! Looks beautiful. 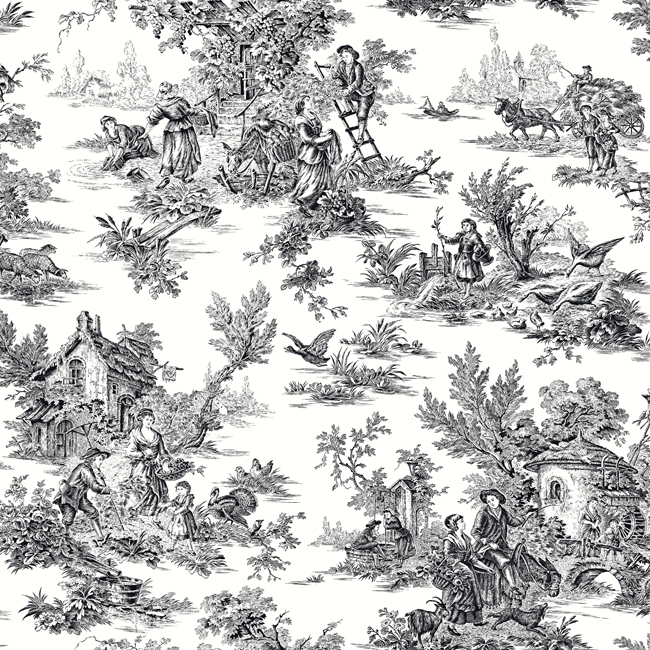 I checked out the link to modern toile, and I find the toile you used easier on my eye. I not a fan of toile, I find it too busy for my taste, but this room looks great. Absolutely love this room! It is definitely my favourite from this house. Thanks for sharing. What happened to the hand lamp? Please tell me it found a good home. I’ve been thinking about purchasing the round mirror from Target, but hesitant because of the reviews. Is the reflection distorted? I have that mirror and I love it! I think it looks more expensive than it is and I haven’t noticed the reflection being distorted at all. I would definitely buy it again. I have it hanging over a buffet in my dining room though, so I don’t ever use it to actually check my own reflection. My Target usually has at least a couple in stock, maybe you could check it out in person first? I have it and love it. I bought it in store so maybe issues with distortion are due to the shipping? But mine is not distorted at all and it’s beautiful. It looks so similar to one from West Elm but without the hefty price tag. I have it and really, really like it. I can tell its not a fully flat mirror surface, but for us it’s more for decoration (above a dresser) and bouncing around light than actually looking into, so it doesn’t bother me much. If it was in my foyer or somewhere where I’d actually look into it to see if I have something in my teeth, it’d drive me a little nuts. Just a little, though. It’s slight enough that my husband would have no idea if I asked him about it. Question: how do you guys hang the artwork above the bed? In California, earthquake country, do you add anything extra to keep them from falling on people if there’s a quake during the night? ^^This. Even in Virginia, we occasionally have earthquakes. I’m wondering if a French cleat is the answer here? I would also appreciate at some point (unless you’ve done one already?) a post on how to anchor things such as bookcases and curtain rods. Even with screws and drywall anchors, my kids pulled out a picture ledge last week, and my dog pulled out a curtain rod (by stepping on the bottom of the curtains where they were puddling on the floor). Clearly, I don’t know what I’m doing, even when I follow the directions (i.e. the directions that came with the wall anchor screws, and the directions that came with the picture ledge). I had to stop after checking out the toile. Is there really a black man pulling a gun on a white person on this toile? Made by white men? That is gross and frankly, racist. Wait, what? I don’t see that on the wallpaper. https://www.wayfair.com/York-Wallcoverings-Campagne-33-x-20.5-Toile-Wallpaper-WHW2060.html?PiID%5B%5D=11247664&source=hotdeals&SSAID=687298&refid=SS687298 – zoom in and you can see the renderings. While I don’t love the toile for myself, I love how this room is transformed. Such good layering and mixing of pieces and textures from what it was before. Great inspiration for my own guest room which is so very blah right now. yes, I too thought it seemed extremely racist. Dang!! Isn’t it enough to have the constant media depictions of the “scary black man”? Will I really have to explain WALLPAPER to my black son?!! Come on! The designers say that isn’t a black man. Make of that what you will. Hmm, not convinced. They are, however, pretty convinced of their own coolness. If that’s not a black man, their execution of color and contrast is pathetic. And their line questioning how it would be racist if he were black, since “people of all races commit crimes.” Ah, yes, thanks, now I get it. Not that one; the other one Ginny referenced. The cheeky part for me was people drinking on park benches. I feel terrible that this has offended people and really not my intention at all. For anyone that has been upset by this please accept my sincere apologies. We’ve taken it down now so that it doesn’t offend or upset anyone else. Hey guys, I hadn’t clicked on the link when I read the post, but once I saw the comments I panicked, was offended as well and deleted it immediately. We are so sorry, and I personally hope that no one buys or uses that wallpaper. Can someone pls. tell me where you got the hand lamp (and/or where it went back to?)?? Love it! I love this room, it’s one of my favorite spaces you guys have done – but I’m surprised to see sconces and bedside lamps together! Just curious, what was behind that decision? I see an overhead light, so I assume it wasn’t because the room needed it…was it just to fill out the wide nightstands? How do you determine how high & where to place the bed side light on the wall? I have a Q bed with a small amount of room on either side so no actual bedside table…. Yeah, I think they used the same spot the old lights were mounted, and they look WAY too high to be reading lights. The table lamps also are in the far edge of the nightstand. That must be quite a stretch to turn them off at bedtime! I agree fully. I can only imagine drifting off while reading, only to have to climb up the headboard like a squirrel to turn off the reading light. I would want a drawstring. I like all elements of this room except for the mid-century dresser. It seems out of place and make the room slightly dated. Agree with the other posters that the “cheeky” wallpaper is offensive. I hope Emily/the team comments on this. Not cool. This space looks great! I absolutely love how you guys used a more traditional wallpaper and added modern flairs. So many amazing, yet simple home decor touches in this space. I always have a hard time pairing gray/ metallic pieces with wood for some reason I can never pull it off but in this space it just nicely ties together the traditional feel. I love that this space has a sense of humor!!! And I also really like the way the rich wood tones warm up the room a bit. That wallpaper! I am in LOVE! What a gorgeous room! Long (looong) time follower of this blog and am honestly a super massive fan of all of EHD’s work… but I had a wee bit of a problem with this post… specifically, the second/third last line: “Do you think we should have gone with a modern toile or do you like the more traditional in this space? Would love to know what you think”. I understand that this is a blog and that you are catering, and I guess in a way advertising to your audience which is awesome and if I weren’t living in a different hemisphere, I would totally hire you guys! However, if I had just hired you to complete a job that I had to live with for the next x years, and knew it was going up on the blog, I would not want the work to be questioned by the same people who were in charge of the design. Of course, this is just my preference, and while people will weigh in their thoughts/opinions regardless, I think asking if you think you should have gone with a more modern wallpaper at the end of a blog post sort of looks like you weren’t really sure about your decision as an interior designer. Wow, this room is so unique and I am so in love! Obsessed with that hand/globe light on the dresser?! I love the furnitnure in this space! I wish it was in my room! Hi! Question about th3 bed…I bought the same one this fall, but it seems too big for my king sized mattress (the slats show on the sides). Wondering if you ran into the same issue at all? LOVE it! Nice work. I’m a sucker for wallpaper and blue. Toile isn’t generally to my taste, but I do think it works quite well in this space since you’ve balanced it with more modern elements. The simple graphic artwork is such a great counterpoint! And the dresser- WOW! I live in Dallas and have been to Round Top once, but your post is making me want to go back this fall. I am pretty darn cheap so I have a hard time with the prices on a lot of the items you bought, but I do really love the special wooden bowls/trinkets, leather garbage can and that pine dresser. I love those round feet so much! Oh, my! What a transformation! Can I visit? Love the wallpaper! love everything! (Except the gold hands. Too 80’s for me). Beautiful Work! Definitely going to use some of the decor ideas shared here for my condo. With the help of Furnishr, I know my bedroom will turn out very good. You may want to check out their work too, they are amazing!